People often hire contractors to avail their services and simplify certain tasks for them. In lieu of these services, the contractor offers an invoice to the customer, which elaborates the services incurred and the amount due. This is done using contractor invoice forms. These are specially designed to help contractors to list down their services and rates in an organized manner making the whole transaction easy to decipher and understand. You may also see Invoice Forms. 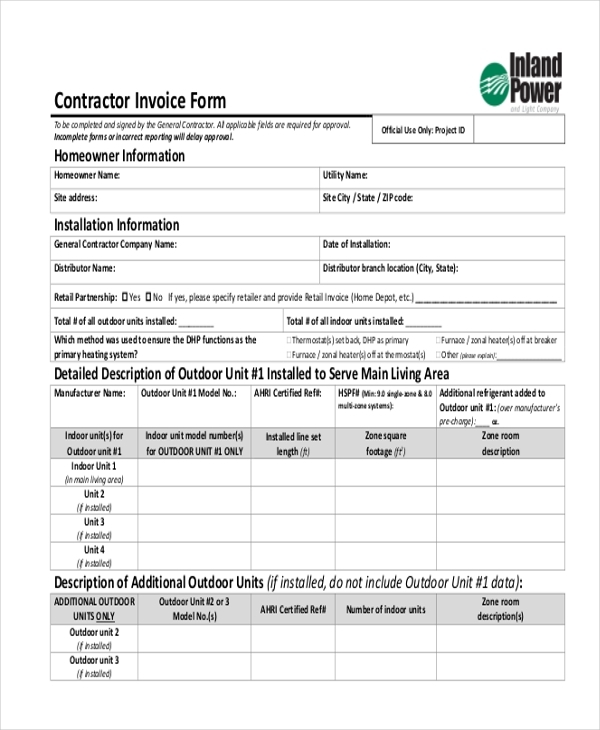 This is a sample of a Contractor Invoice Forms that gives the user an idea of how to design such a form and the important segments to be included. It follows a standard format and can be used by anyone. 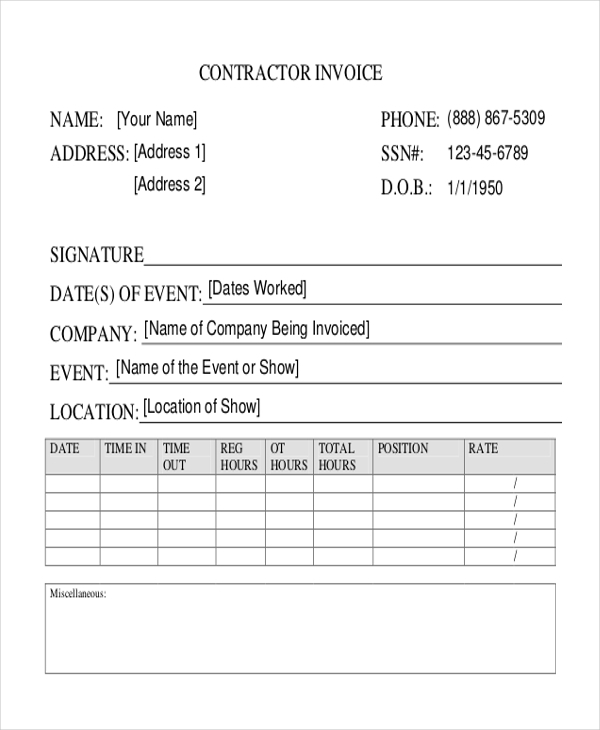 As the name indicates, this sample invoice form is blank and can be customized by the user as per his needs. However, it follows the desired format for such forms and can help in simplifying the transaction. 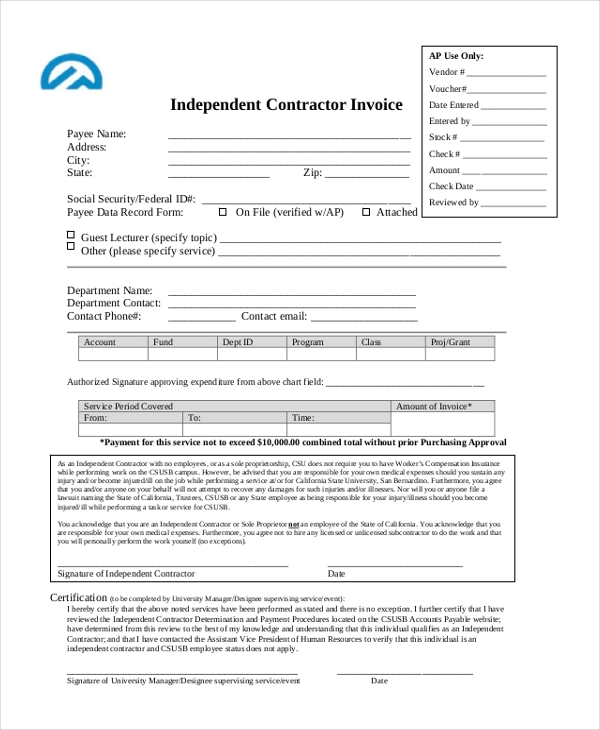 When an independent contractor wishes to generate an invoice to claim the amount to due for the services rendered by him, he can use this form to enter the details and send it to the client. This form is usually used by a contractor to calculate the tax that he may be liable to pay to the government based on the invoices generated by him during a particular period. 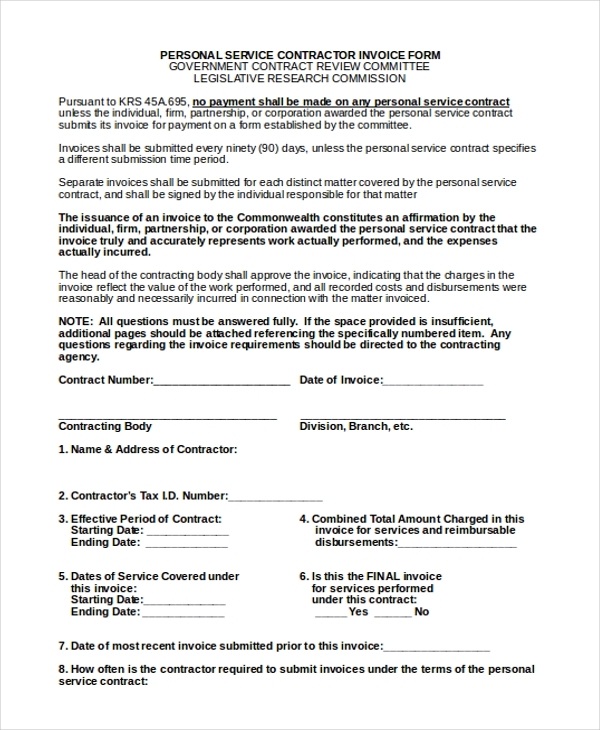 A contractor who works independently and offers personal services to the clients can use this form to submit the details of the services rendered by him and the amount that the clients are liable to pay. 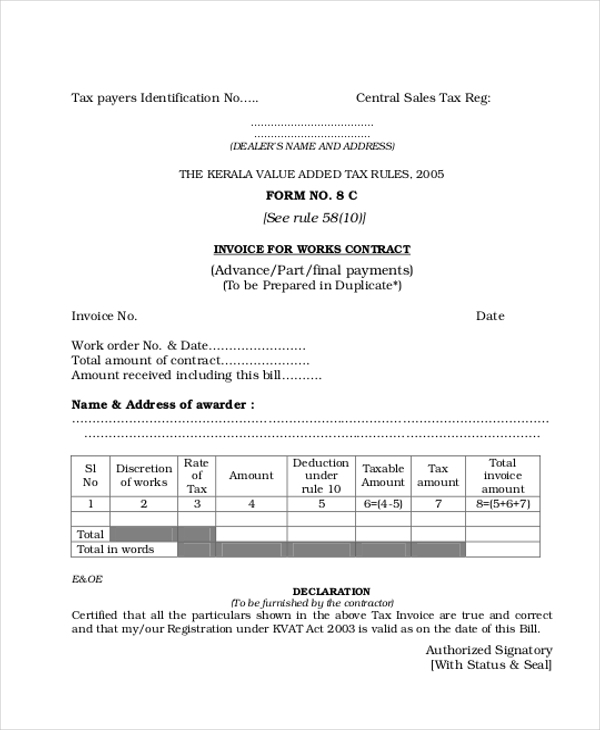 This form is generally used by a works contract to elaborate the services rendered by him on request of a client. In this form, he has to fill in the details of his services along with his rate and total payable amount. This standard invoice form comes in handy for a financial contract who offers financial services to his customers. This sample gives him an idea of the format to be followed and the segments to be included in the invoice. 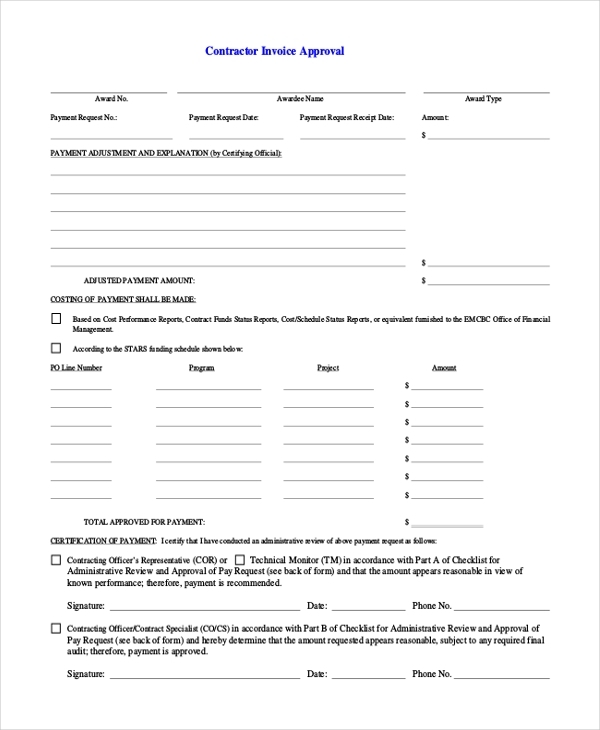 When a government agency hires a contractor for a special purpose, it uses this form to enable the contractor to generate a proper invoice. 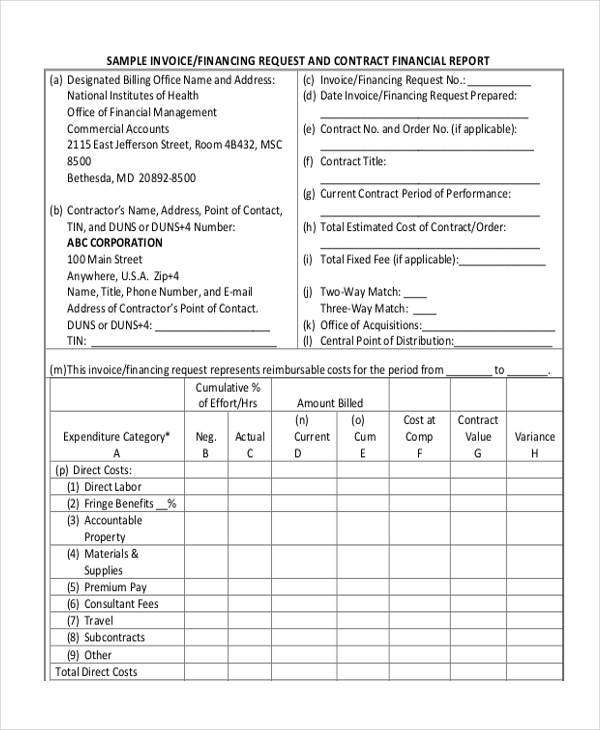 This form is used by the agency as a review document to ensure that the contractor has listed everything properly. They clear the payment when they are satisfied with the review. These forms can be used just as it is. However, if you want to make some changes to the designs to get the form in sync with your requirement, you can do this too quite easily You can also see Commercial Invoice Forms. 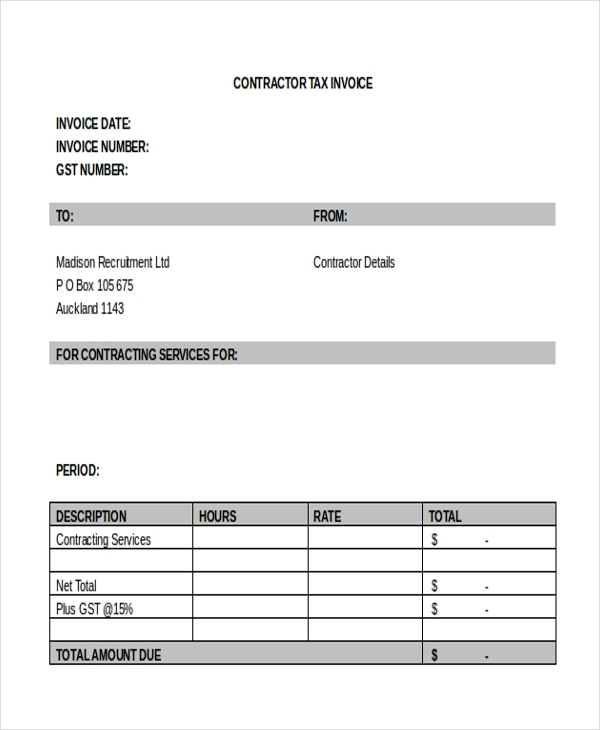 In case you could do with some help while designing a contractor invoice form, look no more. We offer a wide range of these forms and finding one that will be apt for you is definitely easy. These forms can be quickly downloaded and customized. Available in MS Word and PDF format, these forms are print ready and help you to save a lot of time. You may also see Sales Invoice Forms.